Using Charity Miles you can raise money for the World Food Programme just by running, walking or biking. Your results are posted to your Facebook page. On Thursday, I went for a run in 20-degree temperatures to raise money for the UN World Food Programmme (WFP). The WFP is the largest food aid organization in the world and currently feeding Syrian refugees, among many other relief missions in conflict and disaster zones. Think of the Syrian refugees who are suffering from hunger and cold as we speak. Having fled their war-torn homeland they are seeking refuge in neighboring countries. Aid agencies, who are lacking funding, are struggling to feed, clothe and shelter them. Some of them arrived at refugee camps only to be uprooted again by fierce winter storms. Using the Charity Miles app I ran 5.9 miles for the fundraiser. This means a donation of 14 meals by Charity Miles to WFP. So far WFP has received donations of more than 21,846 school meals from just this one app. These donations are going to the area of greatest need among WFP programs. The United Nations says a record number of Syrian refugees, 30,000 of them, have arrived at the Za’atri camp in Jordan since the start of the year. This crisis is fast escalating and with no end to the war in sight the humanitarian situation could get much worse. Aid agencies need more support from the international community. Most of us are far away from this humanitarian disaster in the Middle East. You feel more helpless the further the distance. You can donate to a Syrian relief fund set up by WFP. Or if you use Charity Miles you can exercise and raise funds. For many of us who work out anyway, why not add on this component? It’s easy to use. You just download the app onto your phone, connect it to your facebook account and start exercising. Whole sports team could use it during their practices and raise money for the World Food Programme. The NFL teams, for example, could take an hour out of Super Bowl week and run a mile and raise tons of meals that way using Charity Miles. The NFL took part last year in the Famine, War, Drought campaign with the U.S. Agency for International Development (USAID). 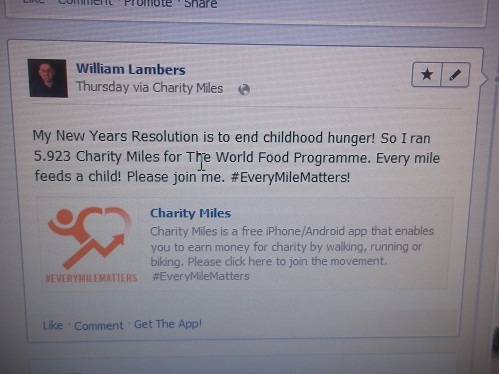 Using Charity Miles would be an easy way to expand that partnership. Humanitarian needs are massive in the world today with so many conflicts ongoing. There are ways to be involved relatively easily. Article first published as Running to Feed Syrian Refugees on Blogcritics.